No snow again and even a little bit warmer! 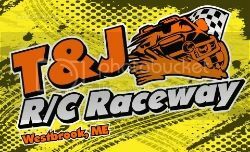 6:30PM start.Open buggy,17.5 SC,Mini 8T,Rally car and box stock Dromida.We are in the process of organizing a trophy race Sunday April 19th for the Tuesday night classes. Late spring and into the summer on Tues nights we are trying to build a rock racing course so we can get outside and try something different!